Lisbeth Salander sprang from Stieg Larsson's imagination in the phenomenally popular Millennium novels. But Noomi Rapace, little known before she got the part in the movie and TV trilogy that played in Sweden in 2009 and in U.S. theaters this year, quickly became the face and soul of Larsson's hacker heroine. Some of that spooky symbiosis is due to Lisbeth's eccentric accessories: the black lipstick, the ring-pierced nose, the tattooed dragon covering most of her back. There's also the actress's look: the high-contrast hair and features and the sinewy body she trained for months to achieve. Both IT machine and feral predator  she doesn't walk, she prowls  Lisbeth is also, in Rapace's performance, fully vulnerable, totally human. Oscar voters don't seem to have her on their radar; too bad for them. Nor will she play the role in David Fincher's English-language version; the part went to The Social Network's Rooney Mara. 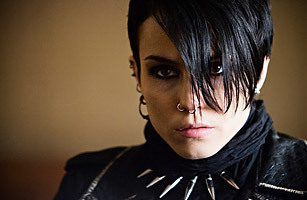 Fervent cinephiles, however, know who the one true Lisbeth is.